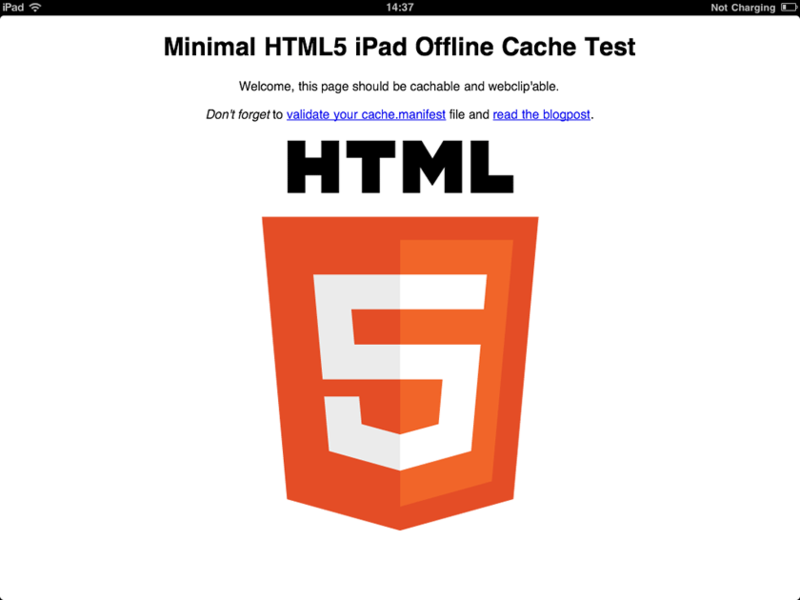 Basically it’s a demo of a simple webpage that can be cached offline on an iPad. It also contains the meta tags required to make it work as a so-called “webclip”, that is you can add it to the homescreen on an iPad and it will open in fullscreen without the URL bar at top and without any other safari elements. Sweet. 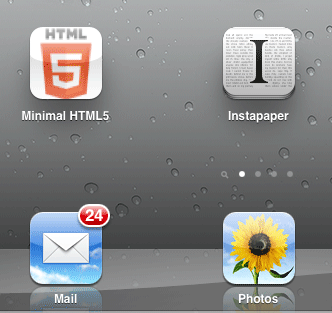 No trace of Safari – it looks like a native app (or it could if we just styled it). Don’t worry, that popup means that everything works. 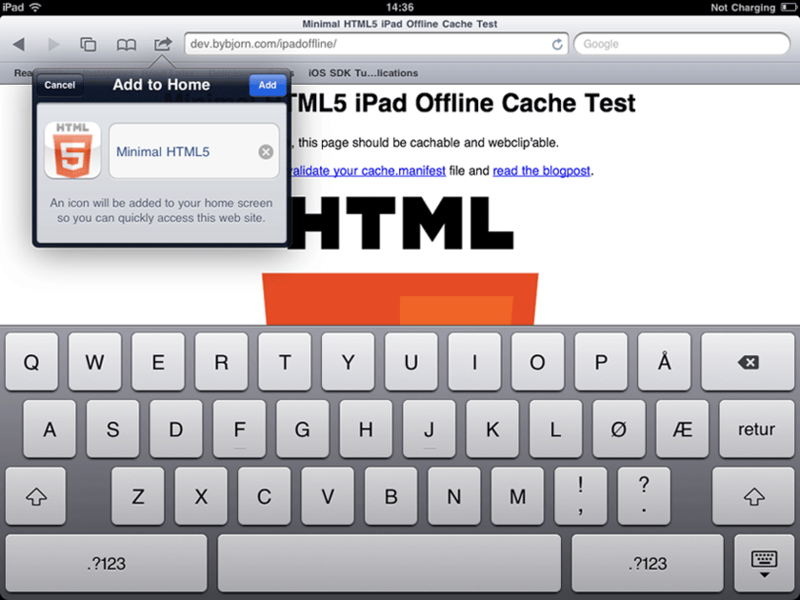 You’re in offline mode, so Safari is not able to cache anything. You’ll find the code for listening to these window.applicationCache errors in offlinetest.js .. you do not have to load that file if you do not want to. 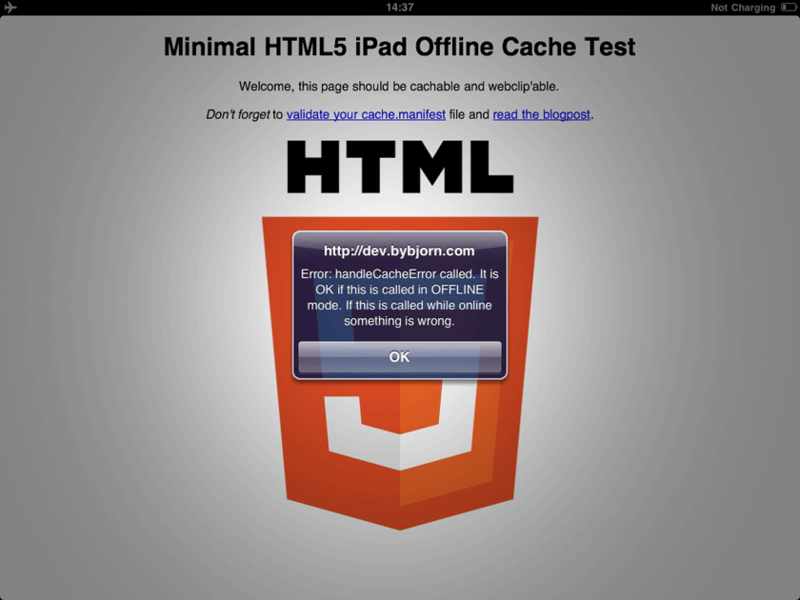 If you’re not able to use the page linked above offline on your iPad the problem is most likely with your iPad. If the demo page does not work for you, try upgrading your iPad software. I was running 4.2.2 and had problems getting offline caching to work but after upgrading to 4.3.5 everything worked perfectly. If the demo works, but it does not work when you upload on your own server, it might be that the .htaccess does not work on your server so that the cache.manifest file isn’t getting sent to the browser with the “text/manifest” mime-type. Try out the manifest validator. The first is something you just read, but I bet it didn’t really sink in, so here it is again: if even a single resource listed in your cache manifest file fails to download properly, the entire process of caching your offline web application will fail. Your browser will fire the error event, but there is no indication of what the actual problem was. just a question: have you tried to create an offline “app” with more than a page? Because I noticed that only the first page is shown without Safari frame… The other pages are opened within Safari as usual. If it doesn’t work check the “private navigation mode”.